A renamed Beolit 611T, with novel features such as the rubberised feet that extended from the cabinet when the handle was moved downwards, allowing the set to be positioned on its side without danger of marking the cabinet. This wood-clad model was positioned towards the top of the Beolit range at the time, with only the mighty Beolit 1000 its superior in terms of looks and performance. Essentially a Beolit 700 chassis with some minor modifications, mounted in a wooden cabinet, the Beolit 800 fitted neatly in the Beolit range between the 700 and the very well specified 1000. The set was powered by 6 ‘D’ sized cells, and covered FM, LW, AM and SW wavebands, with the latter having its own dedicated rod antenna (both could be used for FM coverage). These were positioned at opposite ends of the chassis, unlike the Beolit 700 where they were placed next to each other, and gave a particularly pleasing symmetry when deployed when the set was operating on its side using the handle as a stand and the feet built into the cabinet. 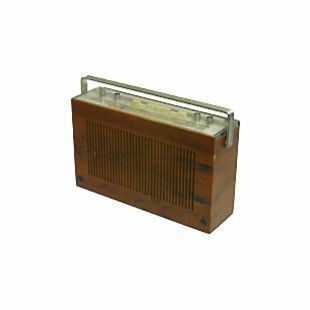 For its time the Beolit 800 was a well specified portable radio and commensurate with its price tag, B&O equipped the set with features that would be expected of a radio at the higher end of the market. Connections for an external speaker or headphones, and a tape recorder or gramophone were located at the bottom of the set, with cut outs on the bottom plate for the cables to exit if connected. Treble and bass controls were provided, as was a separate tuning scale for the FM band. A duplex drive was fitted to allow a single tuning knob to be used on both the LW/AM/SW and FM tuning scales depending on which band had been selected. 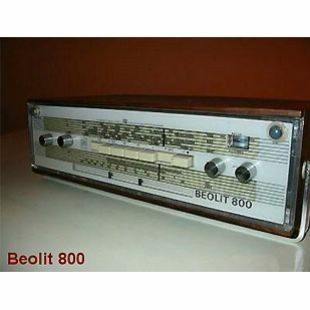 Like many of the other Beolits, the 800 included a ‘Radicator’, which served the dual purpose of showing the battery voltage when no station was tuned in, or the extent to which the receiver was tuned to a particular station. This latter function was particularly useful if the owner wished to use the set to take bearings using the internal ferrite rod antenna. One interesting feature not copied on other Beolits was the use of a series of sliding indicators in a channel running underneath the FM tuning scale. 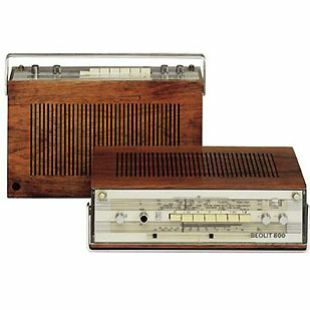 Presumably an early and simple form of pre-sets, these could be lined up with a particular station’s frequency, and used to quickly line up the tuning pointer to these frequencies. A useful feature no doubt, but a disappointing one aesthetically as the sliders were made of flimsy plastic, and did not do justice to an otherwise visually pleasing set that was well constructed using mostly wood and metal parts. 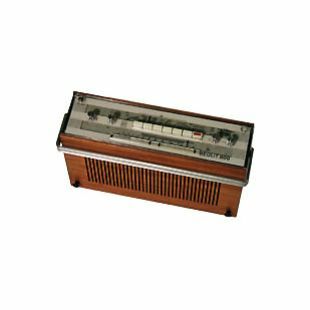 Overall though, the Beolit 800 was a well thought through addition to the Beolit range, offering as it did a range of placement options in an elegant wooden cabinet for the discerning customer. When it was withdrawn in 1968 it was not replaced directly, and the mainstay of the Beolit range to come in the form of the Beolit 600, took some of its styling cues from the Beolit 1000, leaving the 800 and the 1000 as the last Beolits to be offered with a wooden cabinet. Review kindly written by Beoworld member John Barker. Image from www.johansoldradios.se with thanks from BeoWorld.